Persians will require regular grooming, usually at least once daily in winter when they are in full coat and less often in the summer months. You will need to purchase several grooming tools. I find the most important tool is a wide toothed comb. Buy the best comb you can find, you need to be able to get through the thick coat and right down to the skin otherwise they will matt. Make sure the tines are not too sharp. You can find the Ashley Craig Greyhound combs I use online at http://groomersparadise.com and http://www.petsonthepark.com.au They are in New South Wales and NO I don't have shares in either of these businesses ! 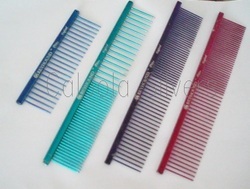 I just love these combs, they just glide through the coat. They are not cheap but certainly worth every dollar. at http://www.ozgroomingworld.com.au/ that is a good cheaper substitute at just $9.00 plus postage. It is the Medium size Groomix Grooming Buttercomb found under Dogs - Grooming - Brush, Comb and Deshedder. They also have the Wahl Professional Comb at $14.00 Both these combs are a good cheaper alternative. Besides a good diet, regular grooming and bathing is the best way to keep the coat in excellent condition. When combing pay close attention to areas prone to knotting, eg: behind the back legs, under front legs (armpit area) behind the ears, under the chin, the chest area and between the back legs. Never wet a knotted coat, it just makes it worse. It is better to try to remove the knot by shaking a little talc into it and then gently pulling it apart with your fingers. If this does not work then just cut the knots away very carefully making sure you do not cut the cat. It is best to use round tipped scissors. Once the cat is knot free you may also shake a little Talc into the dry coat and brush through and fluff up with a bristle brush or slicker brush. The Talc will absorb any grease and keep the coat looking good between baths. Be extra careful not get any kind of powder in the cats eyes. If the coat is badly matted you will probably need to ask your vet to sedate the cat then shave the coat. The eyes may need cleaning each day and for this you can use a just damp face washer or you may want to use Saline Solution or one of the special eye cleansing mixtures you can buy. Check the ears for any build up and use cotton balls to wipe them out. Never poke anything deep into the ears, eg a cotton bud. Nails will need regular trimming every two or three weeks and you can purchase a special tool for this at pet supply shops. Obviously you will not need all the tools I have listed below. This page is a work in progress and I will be adding more details in the future. I will discuss bathing in another article. Below are some of the Grooming Tools and Supplies I use in my Grooming Room. Kept in two Hairdressers Trolleys so it is easy to access what I need. I use a Liberty grooming table. I find most of the time I reach for the "Beast" 7 1/2 inch Ashley Craig Greyhound comb. comb I have in my collection. I would be lost without it. I have two different Electric Clippers but I prefer to clip by hand. 2 Master Grooming Course Comb 7 inch with extra long teeth. Several Small Soft Toothbrushes for applying Powder. List is incomplete at this time. These are items in my everyday Grooming Box, I also use other products when Showing. Below are the Ashley Craig Greyhound combs I use. The Bathing List is another Story!